Kristen and Dustin were married just over a week ago at the Wayfarer’s Chapel in Palos Verdes in a beautiful evening ceremony in a gorgeous glass building. I had never been to the chapel they selected for their wedding, but was looking forward to seeing the venue after they told me the name and sent a link with photos of the grounds. The Wayfarer’s Chapel is a small building made mostly of glass which made for great light during the evening ceremony they had planned. I have known the Parsons family for several years, so being thrown into a busy wedding weekend with them wasn’t much trouble at all. Both sides of the family were pretty busy running around taking care of last minute preparations and getting things set up. Kristen’s brothers are all military men who flew in from around the US for the ceremony. Dustin and his twin brother Dillon are military as well and have recently returned from their tours. The cool thing about all of this is that everyone was going to be in their dress uniforms for the ceremony! The evening of the rehearsal was short and sweet with most all of my questions being answered with “No. You can’t do that.” Basically I was banished the back of the chapel with further restrictions on when I could shoot (no flash, etc). This is always incredibly frustrating as a photographer since it basically makes the wedding a one-lens affair. I had to use my telephoto pretty much the entire time since I was 30-40 feet away from the front. 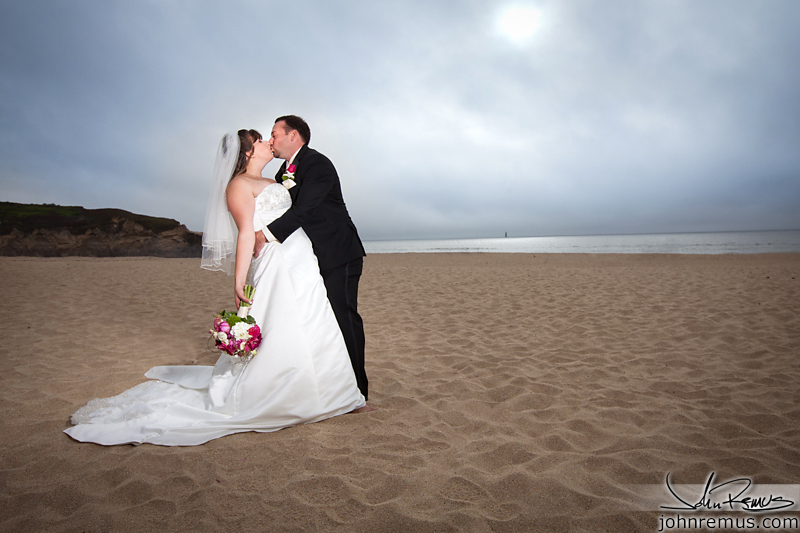 The wedding day started later than normal since the Parsons planned a night ceremony at 8pm. So the bridal parties prep was started right after lunch. Sister-in-law Lauren was doing hair and makeup for Kristen and several of the family members and bridal party. Once everyone was ready we took a few moments before loading up into the limo to do a very quick first-look. Since everyone was going to be in the same car on the way to the chapel Dustin and Kristen agreed it would be nice to have images of the first time seeing each other. 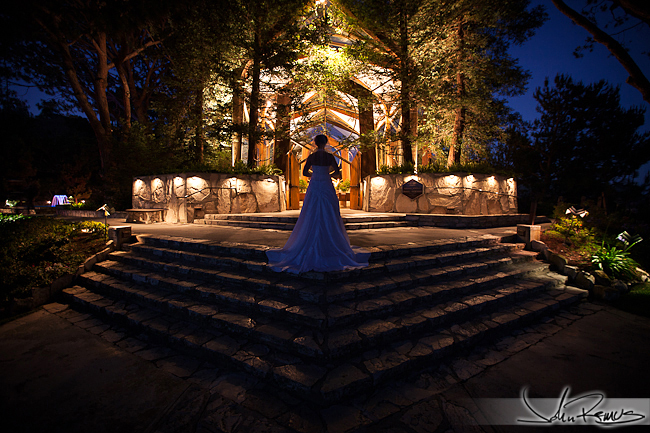 After arriving at the chapel we took some time during sunset to get some of the different group shots out of the way. There wasn’t a clear answer on exactly how long we would have after the ceremony for photos, so we wanted to try and get as many done outside as possible in case we couldn’t do them inside afterward. The ceremony was beautiful, but the lighting was pretty difficult. When a venue tells you “You can’t use flash, but don’t worry you’ll have plenty of light coming in.” they obviously mean day time weddings… and have forgotten that you’ll be shooting an evening ceremony. Thank god for today’s sensors and RAW image processing to get enough detail in low light shots. Keep in mind everything had to be shot with a telephoto in addition to no flash AND little sunlight. hahaha! They still came out great though… scroll down and you’ll see. Promise. The reception was a blast, but very short since everything was later in the evening due to the ceremony time. Click past the break for over a 100 images from my weekend with the Burney and Parsons families. Ana and I have been talking about her wedding since last year – and now it’s already over and they’re returning from their honeymoon! And when I really stop and think about it, it doesn’t seem like that long ago that me, Ana, and several of our other friends were sitting around in college playing pool and ordering food late at night at Santa Clara University. I’ve actually known Ana for nearly nine years – I met her through a couple friends of mine back in college when we both still were in living in the Bay Area. Since then I’ve traveled around the US while completing my degree – and now for my photography. Ana went on to move to Los Angeles, continue even more schooling and become a doctor. But we would keep in touch online over the years. And then, last year, when Daniel asked Ana to marry him, Ana asked me to be her photographer. For those of you guys that follow my work on Facebook, you may remember seeing their engagement photos that we shot at the LA Zoo. Those were actually somewhat recent since all of our schedules are pretty hectic and it took a while to lock down a date that worked with everyone’s schedules. 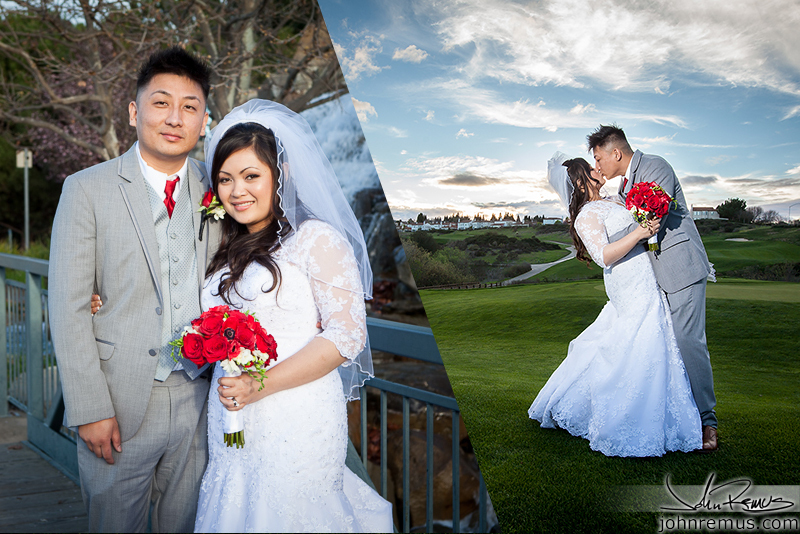 Daniel and Ana were married last week in a gorgeous catholic ceremony in Southern California. When I arrived that morning the men were just heading out to another house for the day. The ladies would actually be using Daniel’s families house to prepare for the morning. So I said my hellos and goodbyes to guys and waited and for Ana to arrive after getting the all-clear that Daniel wasn’t there any longer. The plan was to eventually make it over to meet up with the men as they got ready… and that just didn’t end up happening since things with all the ladies ran a bit later than we expected. Oh well, they have to wait for the bride anyway, right? The ceremony was beautiful, and the church was surprisingly well-lit. Typically for church weddings that I’ve shot they tend to be very dark with very few windows, so it was awesome that this location had tons of light pouring in and made it very easy to shoot plenty of images for Ana and Daniel. From there we headed out to the golf course where the reception was being held. The first hour or so we spent outside taking photos and getting a few more group shots and fun shots in with everyone. And, of course, there HAD to that jerk-golfer-guy that clearly sees us taking photos yet seemingly tries to walk into each of our shots and stand on the practice putting green in the background. There were several times that we had to wait because he walked closer to us to “practice” or whatever. Haha, there is ALWAYS someone like that. You think people would be polite enough to wait 5 or 10 minutes til were were done taking a few photos at that spot and had moved on. Ana and Daniel’s reception was a blast. They seriously had one of the best DJ’s I’ve heard at a wedding as far as his music selection for the night. And there were several family members that didn’t seem to leave the dance floor the entire night – they seriously danced for like 6 hours it seemed like. I stuck around and chatted with Ana as the night went on, and even though I wasn’t really shooting any more at that point it was nice to get to know everyone a bit more and talk. And to Ana and Daniel, Thank You for having me be part of your day! 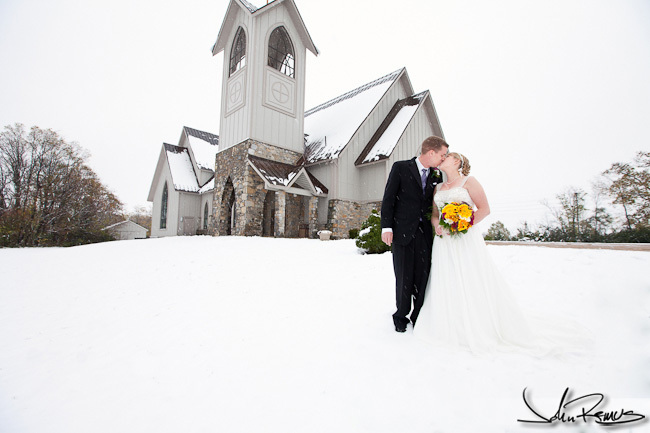 Ryan and Jen Moody – on their surprisingly chilly and snowy wedding day in Virginia! And personally, this photo of the two of them while it was snowing outside made for a wonderfully unique shot. 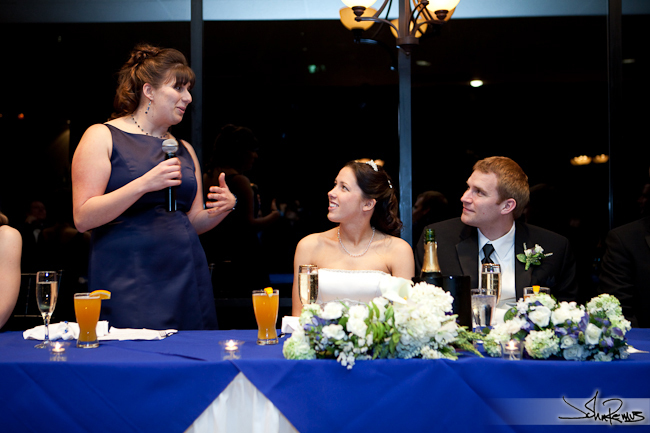 So, a bit of history about me, Ryan, and best-man Mike. We all used to live together in Florida. We were all roommates while doing the Walt Disney World College Program in 2003. Basically it’s a work program that allows you to earn college internship credits while working for the Mouse. I, personally, was a lifeguard and lifeguard trainer for Blizzard Beach water park. And that was one of the best years of my life so far. Ryan and Mike (his best man) were two of the other six guys I lived with out in Orlando. I have so many great memories with them from our time living together that it was awesome to share such an important day with Ryan. Ryan is originally from Texas, and now lives in Virginia where both him and Jen work in government. Originally when planning my trip out to shoot for them I was expecting one of those stereotypical New England falls with lots of colors in the trees and bright blue skies. And, to be fair, it was like that the day before the wedding for the rehearsal when we all were arriving in town and running various errands. The weather reports quickly shifted from Sunny, to Chance of Rain, to Rain, to Chance of Snow, to Blizzard. Well, it definitely did start snowing in the middle of the night and continued the rest of the day and through the wedding ceremony. Good thing we were indoors!! Since I’ve lived with Ryan in the past, and it was just like living with him again while I was there, the morning of the wedding when he was out shoveling snow I was able to run out to take photos and laugh without feeling bad. Actually, I ran out, took a few photos, teased Ryan about how that’s how he got to spend his wedding morning, sent out a photo with my phone to our other old roommates from Florida, and then ran back inside where it was warm. Lift with your legs, Ryan! Unfortunately, due to the unexpected weather, it caused a few small issues with the morning. I wasn’t able to get out to the girls while they had their hair done and the usual wedding-morning stuff. There were also a handful of guests that couldn’t make it due to the road conditions. But it also made for a few fun things, like snowboots and photos with falling snowflakes. But we all had a great time. Their ceremony was smaller and made up of their closest family and friends. The reception was at the George Washington Hotel – and many people were able to make it there that may have missed the ceremony earlier that afternoon. I’ll save the rest of my comments for the captions, as usual. But again, I had a great time meeting both Ryan and Jen’s families. It was awesome to see Mike again, too, who I hadn’t seen in five years since he was still living in Oregon (and we were at another old rooomate’s wedding!). Click the break for more.. I recently returned from Minneapolis, Minnesota where I shot the wedding of Mattie Crawford and Vince DiDona. When I have the chance to head out to the midwest it’s usually an opportunity to see a lot of old friends. In this particular case the brides family and I go back a number of years – I met Mattie eight years ago in Florida when we were both lifeguards. But I met her family years later while attending school in Michigan. I photographed the second half of her gymnastics career for our college newspaper. Vince was a college wrestler, and while I don’t recall shooting him at his meets, I do remember photographing a number of his groomsmen that were on the team. So, there were of course a lot of the gymnasts from college attending, as well as other friends that I knew from school but hadn’t seen in many years. It was awesome to catch up and see so many people. And I joked with Mattie that it would probably be a lot easier to shoot her walking down an aisle instead of flying and flipping through the air, hahaha. I flew out to Minneapolis one day after returning to Socal from the SF Bay Area where I was the week before shooting the Balatoni wedding. So the quick turnaround was somewhat tricky – especially knowing that I had to return to the Bay after flying home to Socal from Minnesota. Yep. Lots of traveling right now. But it was awesome to see Mattie’s family again. Honestly, I can’t believe had been five years since seeing all of them. It makes you realize how fast the time really does go by. It had only been two years since I last saw Mattie and Vince at the Knudson wedding in Michigan during the summer in 2009. Everyone looked the same, so it was like no time had really passed as I caught up with the family after arriving. The Crawfords are wonderful people and truly made me feel like family during all the sports events I would see them at during college – which was awesome since I was 3,000 miles from my own family. I met a lot of the extended family, friends, and Vince’s family as we passed the time before heading to the rehearsal. The wedding was going to be at St. Boniface – a huge old catholic church. The pastor who would be marrying Mattie & Vince turned out to be a very cool guy. He told me I was more than welcome to use flash as long as I wasn’t obnoxious about it. AWESOME. You have to love any catholic church that allows flash – I would say that 9/10 do not. The rehearsal was a breeze, and everyone shared in laughs as they figured out order of events and people for the ceremony. Dinner was after at a nearby park where the families had decorated the picnic area with lanterns and candles. Mattie and Vince’s wedding day was incredibly smooth. I spent the morning hanging out with the bridesmaids and bride, as usual. The problem, if you call it that, is that I hadn’t seen most of these girls in five years… so catching up a little bit was inevitable and I had to keep some conversations short so I could bounce between the rooms the girls were getting ready in. After heading to the church we did a first-look that way we could shoot all the family photos before the ceremony. It helped shuffle everyone out the door after the wedding, and allowed us time to go out and get a few images with the downtown skyline in the background. The image above we tried twice. And there was just no way we were going to get everyone’s faces showing with 21 people on a high-traffic bridge on Friday afternoon… ha! Saturday after the wedding was pretty chill. I actually didn’t end up taking any photos and instead socialized and relaxed with everyone. We all had a picnic out in the park and spent the evening hanging out at the hotel. Minneapolis was great. I had an awesome time and it’s a really cool area in the parts that I got to see. Who knows, maybe I’ll eventually be heading that way. For those of you who remember, earlier this year I was one of the nationally selected applicants for the Viking’s team photographer position. They postponed interviews unfortunately so I don’t know if it will open up again to continue the interview process. Mattie and Vince, I had an awesome time. Vince, your family is wonderful and I’m so glad I got to spend some time getting to know them in between all the running around. Mattie, you know I love your family, they’re amazing. To everyone else that are old friends or new, it was great catching up, and awesome to meet the rest of you between all my running around. After the break are over 150 images from the wedding. As usual I’ll throw in various captions here and there. Otherwise simply enjoy them, I liked a lot.